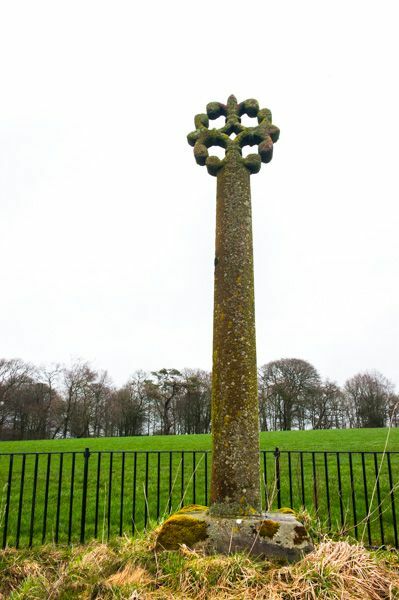 Merkland Cross is a medieval wayside cross crafted in a floriated design. 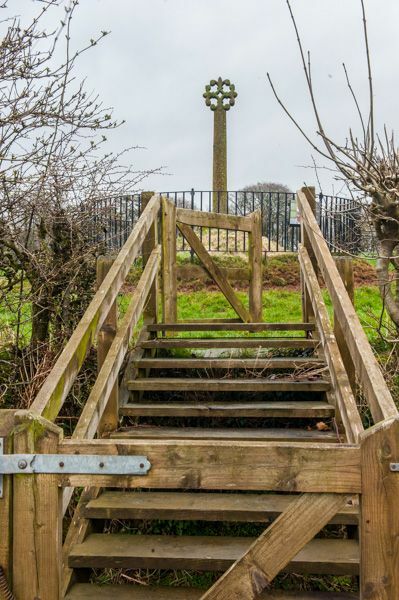 The cross stands next to the main medieval road to Annandale. 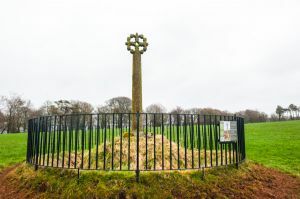 Today the presence of the A74(M) overshadows the cross, which stands on the course of the Roman road north from Gretna into southern Scotland. The cross is over 3 metres high, on a slender shaft. We are not certain why the cross was erected. It may simply have marked a place for a regular market or a regional meeting place. 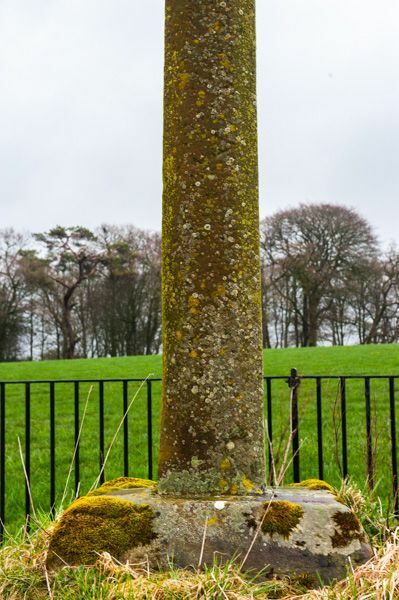 One unproven theory suggests that it was erected in memory of John, Master of Maxwell, Steward of Annandale, who died near here in 1484 while fighting an English force under a pair of outlawed Scots, Alexander, Duke of Albany, and James, Earl of Douglas. There cannot be another historic site in Britain where the past and present collide more dramatically! 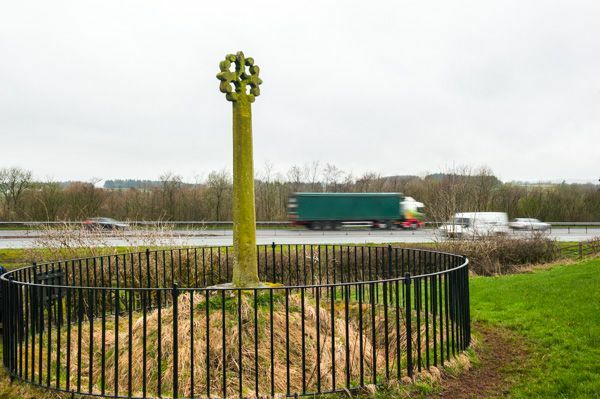 The Merkland Cross stands on a rise of ground directly beside the busy A74(M). I must have driven past the cross a dozen times and never knew it was there. Yet it isn't hard to find; the cross is signposted off the B7076 between Kirtlebridge and Kirkpatrick Fleming. A narrow lane leads to Woodhouse Mains farm, where there is room for one or two vehicles to pull off onto the verge. A signed footpath leads through a farm field where curious sheep look on. The way is uneven, and likely to be muddy in wet weather, so good waterproof footwear would be advisable. The path slopes down a small hill and runs parallel to the A74(M) for a hundred yards until the cross comes into view on the right. There is a short set of steps and a gate leading through a hedge to the cross, which is protected by an iron railing. There is a Historic Scotland information panel telling what little is known about the history of the cross. 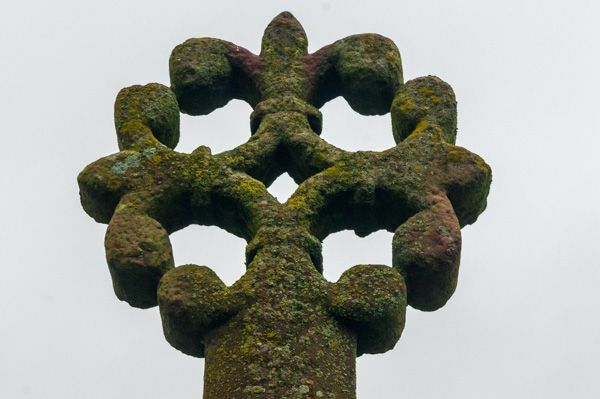 As for the cross itself, I was very impressed by the delicate quality of the cross-head. It reminded me of high-quality window tracery in a medieval church. My wife pointed out what I missed at first glance; that the cross-head is carved in the shape of 4 fleurs-de-lys radiating out from the centre. A sign of French influence, perhaps? The noise of the motorway is a constant background, so it isn't the sort of place you'd want to linger, yet there's something quite appealing about the cross and the way it has managed to survive in such an inhospitable environment. I'm determined to come back in better weather for another look!